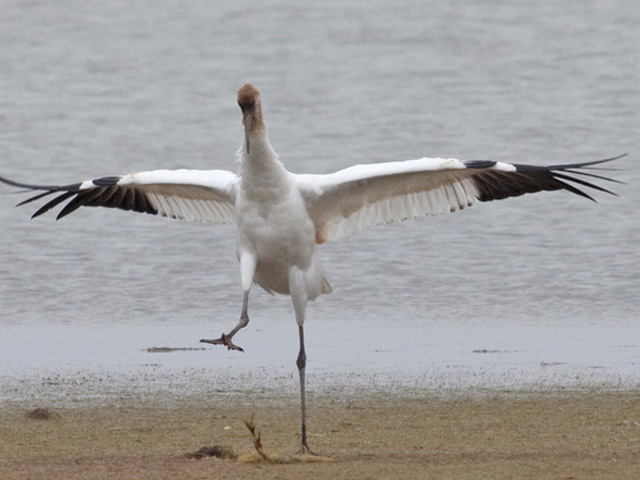 By December, Whooping Cranes are settled on their wintering grounds. The western flock overwinters on Aransas National Wildlife Refuge in Texas. The reintroduced eastern flock is mainly in Florida, with a few birds in nearby states such as Tennessee, Alabama, South Carolina. This juvenile and its parents just arrived at Aransas after a 2,500-mile migration from Canada. The curious young crane has found a new plaything: a piece of seaweed on the shore of the Gulf of Mexico. It's a time of discovery as important and new as when he had just hatched in Canada. The watchful parents are always nearby, and happy to be back where they can find blue crabs to eat!